Today is my third day at sea and I’m enjoying every moment; time onboard the ship flies. Although time onboard is dwindling, lots of discovery remains. Sunday brought sunny skies and warm temperatures, another perfect day for whale identification. It has been a real joy working with this exceptional group of professionals. Everyone is very supportive of each other and mission focused. 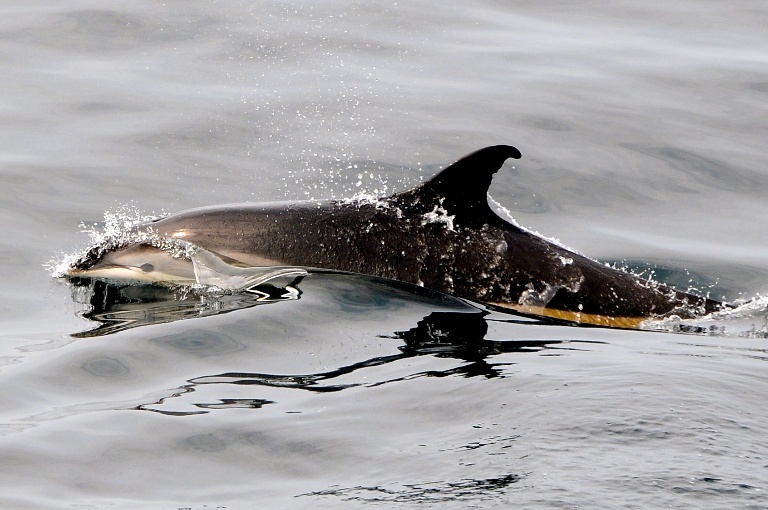 The mission of this cruise is Cetacean research, but what exactly is a Cetacean? Cetus is a Latin word used in the context of biology defined as “whale”. Whales and dolphins are included within this order of classification. As stated in my earlier blogs, we are focusing on sei whales, pronounced ‘say” and beaked whales. Why study sei and beaked whales? These whales are some of the least studied and scientists know relatively little about them. Information collected so far on sei whales: they have poleward migration trends, feed on small fish, krill and copepods (small crustaceans), and are thought to be populated along boundaries of elevated sea floors such as Georges Bank. Along the border of Georges Bank, upwelling of small prey occur due to ocean currents creating a perfect feeding ground for whales. Sei whales will also skim the ocean surface for food. Unfortunately, due to this feeding habit, many sei whales are struck and killed by large ships. The other type of whale we are searching for are beaked whales. These whales are extremely difficult to identify due to their feeding and swimming behaviors. They are deep divers and spend a lot of time at depths of more than a thousand feet feeding on squid and fish. When they surface, they are inconspicuous and not acrobatic, and they are very difficult to see. Because they are found offshore in very deep waters, there are few opportunities to study them. Most of what is known about these species comes from individuals that have stranded on beaches where people can find them. One method scientists on board use to detect the presence of sei whales is to listen for them using hydrophones (underwater microphones). For this cruise, the acousticians are deploying sonobuoys: short term recorders that can transmit live audio feed through VHF channels. Sei whales generate tonal calls and produce a “down sweep “ from high to low frequency with a range from of 80 – 30 Hz. Sei whales are classified as a Baleen Whale. Baleen whales produce tonal calls typically under 1 kHz. For some species, like the humpback whale, song is known to be produced only by males, presumably to attract mates. After deploying the sonobuoy, we quickly began receiving signature tonal calls of sei whales. A sound spectrogram is used to interpret and project these acoustics on a graph with frequency on the y axis (vertical) and time on the x axis (horizontal). The darker plots indicate that the whale is close and lighter plots are weaker signals. Sometimes they will call in doubles or triple sweeps. Below is an example of a sei whale tonal call of the coast of Nova Scotia. Can you find the call? 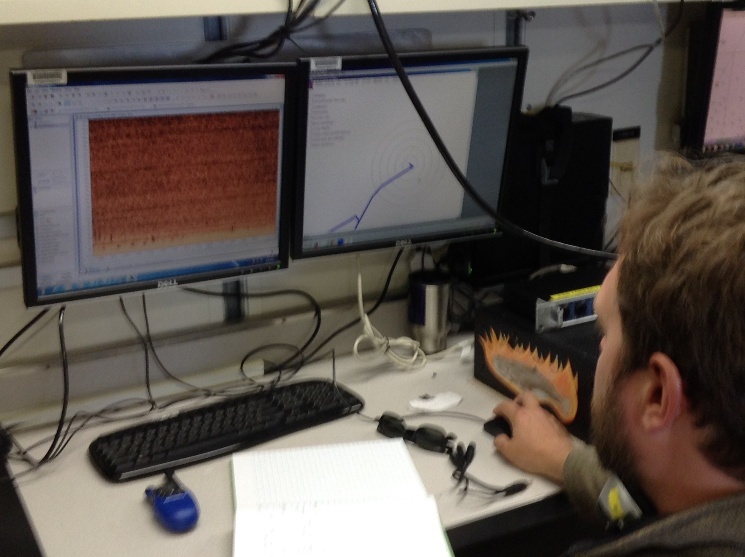 Sei whale acoustic sample recorded off the coast of Nova Scotia. Scientists are not sure at this point what purpose these calls serve; for example, they could be used to maintain contact between individuals, attract mates, or advertise feeding areas. Scientists are also trying to understand the oceanographic and habitat factors that are correlated with sei whale distribution. One question is what kind of prey are in the areas where sei whales are and are not found. In the evening hours, fishing nets are deployed to take a sample of organisms present in the ocean at that location. Shallow nets, called bongos, are used to take samples of zooplankton in the water down to 200m. Tonight, we are in deeper waters and the mid-water trawl net went down to 650 meters for 45 minutes. The net is then pulled in and fish are identified, counted and entered into a computer database. As mentioned above, sei whales like to feed on copepods and small arthropods. Guess what we pulled out of the bongo nets last night? 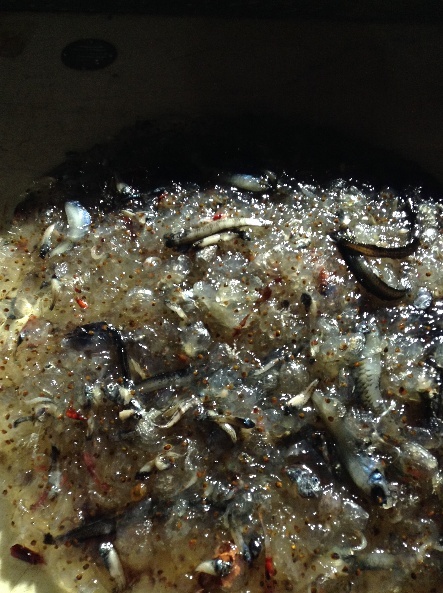 Copepod soup. A delicious dinner for sei whales! Until next time, happy sailing! This entry was posted in 2015, NOAA Fisheries Service, NOAA Teacher at Sea, Tom Savage and tagged baleen whale, Beaked Whales, bong nets, copepods, hydrophones, Sei Whales. Bookmark the permalink.